Harper Lee Award recipients Sonia Sanchez (2004) and Rick Bragg ( 2009) are among nine outstanding Alabamians to be honored by the Alabama State Council on the Arts at the 2013 Celebration of the Arts awards ceremony on Tuesday, May 21, 2013, at 7:30 p.m. The event will take place at the Alabama Shakespeare Festival, located at 1 Festival Drive, Montgomery. A reception will immediately follow the awards ceremony in the lobby of the theatre. The event is free and open to the public but reservations and tickets are required. The Council's Celebration of the Arts shines a spotlight on the arts and artists in Alabama. Individuals are recognized for their contributions to the arts in Alabama and beyond. Al Head, executive director of the Council stated, "This awards program is an opportunity for the state to showcase the work and support of individuals who are a significant part of our rich cultural landscape and bring great credit to our state through their achievements." In offering his congratulations to this year's recipients Governor Robert Bentley noted, "Alabama’s arts community reflects a rich diversity of human resources and endeavors. The arts convey the personality of our state and communicate a unique ‘sense of home.’ From traditional shape-note singers and quilters to world-class theatre to some of the finest museums in the Southeast, Alabama is truly a state of the arts." The Jonnie Dee Little Lifetime Achievement Award represents recognition for an individual who has devoted a lifetime of leadership, service, and support to the arts in Alabama. The award is named after past Council member, Jonnie Dee Riley Little from Auburn, who died in 1988 after serving with great distinction on the Council and in support of the arts in Alabama. The 2013 Lifetime Achievement Award recipient is Lyndra Daniel of Birmingham. She is a native of Louisiana and a former Miss Louisiana contestant who showed off her musical talents at the Miss America Pageant in 1962. Mrs. Daniel has devoted her adult life to supporting excellence in the arts as a volunteer, arts patron, and community leader in the state of Alabama. She served on the Alabama State Council on the Arts for eighteen years and held the position of Chairman for two years. Other board memberships have included the Alabama Symphony, the Birmingham Museum of Art, the Virginia Samford Theatre, and the Alabama Ballet. In 2005 under the aegis of Region 20/20, The Cultural Alliance of Greater Birmingham was formed to foster continued support and expansion of advocacy for Arts. As a founding member of that group, Mrs. Daniel served as Chairman of the Board. Currently she serves as President of the Daniel Foundation of Alabama. The Alabama Distinguished Artist Award honors a professional artist who is considered a native or adopted son or daughter of Alabama and who has earned significant national acclaim for his or her art over an extended period. The 2013 Distinguished Artist Award recipient is Rick Bragg of Piedmont. Bragg is an award-winning author and journalist known for his non-fiction books, especially those on his family in Alabama. He won the Pulitzer Prize for Feature Writing in 1996 for his work at The New York Times. Bragg's most famous book, All Over But the Shoutin', tells the story of his childhood in Alabama, his rise to becoming a notable journalist, his personal struggles, and the stories of his home and family. Bragg worked at several newspapers before joining The New York Times in 1994. He covered murders and unrest in Haiti as a metro reporter, then wrote about the Oklahoma City bombing, the Jonesboro killings, the Susan Smith trial, and more as a national correspondent based in Atlanta. He later became the paper's Miami bureau chief just in time for Elián González's arrival and the international controversy surrounding the Cuban boy. Bragg won the Pulitzer Prize for his work. Currently, he is writer-in-residence at the University of Alabama and a regular contributor to Southern Living and Garden and Gun. The Governor's Arts Award honors individuals who have made unique contributions to the arts in Alabama. Five awards in this category will be given this year: Dr. Wayne Flynt of Auburn; Gordon & Geri Moulton of Mobile; Jean Prescott Pierce of Birmingham; Sonia Sanchez of Birmingham; and Kitty Seale of Montgomery. Dr. Wayne Flynt is a masterful storyteller and an award-winning author of twelve books. A prolific writer, Dr. Flynt examines topics like religion, Civil Rights, education, poverty and politics through the history of Alabama. Dr. Flynt has written extensively and in great detail about these topics throughout his distinguished career. Dr. Flynt focused largely on the historical, economic and social fabric of Alabama in his book, Poor But Proud: Alabama's Poor Whites. He co-wrote Alabama: A History of a Deep South State. Both books were nominated for the Pulitzer Prize. He is editor-in-chief emeritus of the online Encyclopedia of Alabama, a partnership of Auburn University and the Alabama Humanities Foundation. In his various works, Dr. Flynt has consistently documented the important artists, writers, and musicians of Alabama and the impact they have had both nationally and internationally. The retiring president and first lady of the University of South Alabama, Gordon and Geri Moulton, have a passion for sculpture and are avid collectors of glass art. In demonstration of their love and support for the visual arts, the Geri Moulton Children’s Park sculpture garden was conceived and nurtured to completion. The sculpture park is located on the grounds of the University of South Alabama Women’s Hospital. Some of the best known sculptors in the United States created more than 50 life-sized bronze sculptures in the park that provide a tranquil place where children can set aside thoughts of injury and illness, where families can find respite from worry, and where the community can leave behind the stress of everyday life. All of the works of sculpture in the park were donated by patrons. The Moultons’ passion for all art forms led them to create the USA Glass Arts program and facility at the University of South Alabama in 2008. This academic program is one of only two such university programs in the Southeast and one of only a handful in the country. Other achievements by the University of South Alabama President Gordon Moulton and Mrs. Moulton have been the engagement of the USA visual arts department chair and muralist Jason Guynes to create a set of four murals depicting the history, breath and purpose of the university. The murals were also created to celebrate USA’s 50th anniversary. President Moulton has served in various leadership positions at USA for 46 years. In 1988 he became president of the university. Jean Prescott Pierce of Birmingham has spent more than half a century volunteering her time, energy and many talents to the Birmingham Children’s Theatre (BCT), the resident professional theater company at the Birmingham- Jefferson Convention Center (BJCC). BCT has grown to be recognized nationally as one of the most highly regarded theaters for young people in the country. The company occupies three theater spaces in the BJCC and its touring arm, Theatre in Motion, covers the entire state and many other venues in the Southeast. Mrs. Pierce contributed mightily to BCT’s growth with her dedication and talent. She has written countless plays and has been instrumental in the success of the BCT Wee Folks series. After completing her Masters in Theatre at the University of Utah, Mrs. Pierce returned to Birmingham, where she became Miss Jean on WBRC’s Romper Room, the acclaimed show for children in the early days of television. It was not long before she became an active member of the Board of Trustees at BCT, serving in many capacities over the years, including President of the Board twice. She also contributed her considerable abilities as an actress and director, and later playwright, always refusing any royalties or other financial compensation. 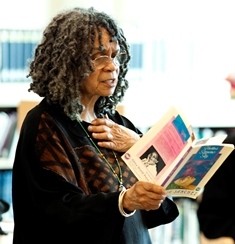 Sonia Sanchez of Birmingham is an internationally recognized poet. In addition to being an American Book Award winner and National Book Critics Circle finalist, Sanchez has received numerous other awards for her work as a playwright, educator, and activist. She is the recipient of a National Endowment for the Arts Lucretia Mott Award for 1984, the Outstanding Arts Award from the Pennsylvania Coalition of 100 Black Women, the Community Service Award from the National Black Caucus of State Legislators, the Governor’s Award for Excellence in the Humanities for 1988, the Peace and Freedom Award from Women International League for Peace and Freedom for 1989, a PEW Fellowship in the Arts for 1992-1993, the Langston Hughes Poetry Award for 1999, the Harper Lee Award for Alabama’s Distinguished Writer of the Year for 2004, and others. She is the Poetry Society of America’s 2001 Robert Frost Medalist and a Ford Freedom Scholar from the Charles H. Wright Museum of African American History. Mrs. Sanchez was the first Presidential Fellow at Temple University, and she held the Laura Carnell Chair in English at Temple. She has lectured at over 500 universities and colleges in the United States and has traveled extensively, reading her work in Africa, Cuba, England, the Caribbean, Australia, Europe, Nicaragua, the People’s Republic of China, Norway, and Canada. Although she travels frequently, Mrs. Sanchez now claims Philadelphia as her home. She was named the first Poet Laureate of Philadelphia in 2012. Kitty Seale of Montgomery founded the Alabama Dance Theatre in 1986. Under her teaching and direction the Alabama Dance Theatre has gained regional recognition as an outstanding training ground for dancers. Former students of Mrs. Seale include: Wendy White Sasser, a former Alvin Ailey dancer who went on to dance with Complexions; Laura Wolfe of Kansas City Ballet; and Stephen “Twitch” Boss, runner-up on the So You Think You Can Dance television dance competition. Seale has been actively involved in dance as a teacher, choreographer, and director for the past 30 years. Her early study of ballet was with Lucie Stone, Audrey Gryder, Duane Dishion, and George Verdak. More recently, she completed the fourth year of the Russian syllabus under Jurgen Schneider and Janina Cunova. Mrs. Seale’s students have received national recognition and various scholarships. They have gone on to perform with nationally recognized professional groups. She is a life member of The National Registry of Who’s Who. Mrs. Seale is a Montgomery native and graduate of Lanier High School and Sweet Briar College. The Alabama Folk Heritage Award was established to recognize master folk artists who have made outstanding contributions in the arts in Alabama. The 2013 Folk Heritage Award recipient is the Excelsior Band of Mobile. The Excelsior Band has a rich history. It was founded by John A. Pope to celebrate the birth of his son, John C. Pope in Mobile on November 23, 1883. The Excelsior Band has marched the streets of downtown Mobile for over 100 years in various Mardi Gras parades. Additionally, the band, which plays Dixieland and conventional jazz, plays for weddings, receptions, jazz funerals, conventions, and parades. The band performs regularly along the Gulf Coast and is recognized for providing the traditional tunes associated with the carnival season in Mobile, the birthplace of Mardi Gras in the United States. The Excelsior Band is a ten piece marching brass band that consists of three trumpets, three saxophones, one trombone, a tuba, bass drum, and snare drum. The group also performs as a quintet, as requested for smaller events, e.g. birthday parties, wedding receptions, or conventions. The Members of the Excelsior Band come from diverse occupational background and all are famous in the Mobile area for their many years of musical contributions throughout the city. The Special Council Legacy Award was established to recognize individuals who are not necessary an artist or from the arts world, but have had a great impact on the arts in Alabama and leave a significant legacy as a result of their contributions. The 2013 Special Council Legacy Award recipient is Sen. J. T. “Jabo” Waggoner. Sen. Waggoner of Vestavia Hills is serving his sixth term in the Senate after serving from 1966-1983 in the House of Representatives. Sen. Waggoner, President, Birmingham Business Consultants, LLC, received his B.A. degree from Birmingham Southern College and his J.D. degree from Birmingham School of Law. In 2007, Sen. Waggoner was inducted into the Birmingham Southern College Sports Hall of Fame. Sen. Waggoner serves on the following boards: Birmingham Business Alliance; Faulkner University; Vestavia Hills Chambers of Commerce; Vestavia Hills Civitan Club; Greater Birmingham Convention and Visitors Bureau; the Alabama Sports Hall of Fame; and Pinnacle Bank. Sen. Waggoner was elected Senate Minority Leader, 2002-2006 and re-elected in January 2007. In December 2010, he was elected Senate Majority Leader. Sen. Waggoner has the longest record of service, of any legislator from Jefferson County, in Alabama history. Sen. Waggoner was one of the co-sponsors of the legislation that created the Alabama School of Fine Arts in 1971. ASFA is located in downtown Birmingham and is a national model for schools of the arts in the United States. Sen. Waggoner has been a consistent supporter of the Alabama State Council on the Arts and has been a part of appropriations increases for the Council and many cultural organizations in Alabama over his long tenure in the Legislature. The Alabama State Council on the Arts promotes Alabama's diverse and rich artistic resources while highlighting excellence and education experiences. Complimentary Tickets are limited and are available on a first come, first serve basis. To reserve tickets, please contact: ASF Box Office at 334-271-5353 or the Alabama State Council on the Arts at 334-242-4076.